In order to support an application for the erection of an apartment block a desk study report was required to demonstrate that the proposed development was suitable and that after the development the site could not be determined to be ‘contaminated land’. Demeter Environmental were commissioned to prepare the desk study report. The review of the O.S maps provided little information on the history of the site, which was developed prior to the first edition maps and appeared to have bee occupied by dwellings. The site was cleared between 1971 and 1977 and had been vacant since. Aerial plates identified a cabin on the site on the 2009 aerial pate and a vehicle on the 2013 plate. Streetview images revealed the site was a construction site in 2008. The planning history of the site was researched using the Stockport Council planning portal, when it was discovered that there were a number of previous applications. There was no evidence of any site investigation reports associated with the previous applications. Whilst a number of potential sources of contamination were identified within 250m of the site, with the exception of the made ground on the site was discounted. 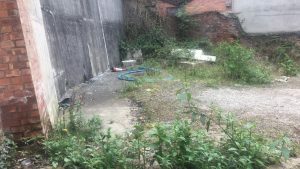 Based on the low sensitivity (residential with no consumption of homegrown produce) and limited landscaped areas it was concluded that remediation in lieu of further intrusive works were proposed. The report was submitted alongside with the planning application (the desk study report can be accessed here. The memo accepting the report is alongside the desk study report on the Stockport planning portal.